Before we get into some of the dangers and complications of obesity lets first talk about what obesity is. When an individual has an excess amount of weight they are considered obese. 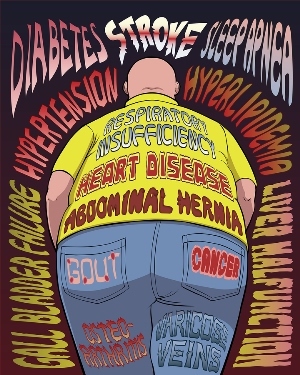 And while this sounds fairly simple, truth be told obesity is a very complex disorder. It’s not just about the cosmetic aspect. Yes that’s important but there are far more important issues such as the health problems that come along with being obese. When you are obese you put yourself at risk for heart disease, diabetes, shortened life expectancy and a host of other issues. The good news however is even a modest amount of weight loss can go a long ways in improving your health. If you have a BMI of 30 or more you are considered obese. To find out what your BMI is you will need to divide your weight by your height. Please know BMI doesn’t always directly measure body fat. For example, someone who has a very muscular build may have a BMI that would indicate they are obese. However, since they are muscular they wouldn’t have enough body fat to actually be obese. So in these cases BMI wouldn’t necessarily apply. If you think you are obese it is a good idea to see a health care provide. Especially if you concerned about your health. Your health care provider will work with you to come up with a plan to help you get the weight off. Now let’s talk about a few of the dangers and complications that can arise due to obesity. As previously stated, heart disease and diabetes can develop when one is overweight. But those aren’t the only conditions that can develop. Other health problems that can develop include high blood pressure, metabolic syndrome, stroke, a variety of different cancers, sleep apnea and other breathing disorders, osteoarthritis and erectile dysfunction and other sexual health issues. As you can see, being obese is no fun. But it doesn’t just impact your health. It also impacts the quality of your life. When you are obese it’s very difficult to have a quality life. The mere fact you are unable to move around like an averaged size person can prevent you from doing a lot of fun activities. People who are obese usually don’t have a social life. They hide themselves in their room because they are too embarrassed to go out. This leads to shame, guilt, depression, sexual problems and so much more. The obese can struggle with various everyday life difficulties. One of which is the general aches and pains in knees and joints, difficulty with moving and a general lack of energy. All of these issues can affect the quality of life, especially, as those who are severely overweight age. There is also the psychological factors, where prejudices and attitudes towards the oversight can lead to significant loss of social connections and unsatisfying romantic relationships. The obese generally lack confidence and have an inherently low self-esteem. This can stem from feeling bad about themselves, or from childhood teasing and reactions to them by society in adult life. They also typically suffer from a negative body image and some even struggle with self-loathing. Even going shopping for clothes can make one feel awful. One of the easiest things you can do is start making dietary changes. Reducing your caloric intake will help you start losing weight almost immediately. Be sure not to reduce your calories by too much. Doing so can be very unhealthy. Instead start by reducing your caloric intake by 500 calories per day, this results in weight loss of 1 pound per week. If you aren’t sure how much you are eating right now you should get a journal and write down everything you eat for the next 7 days. This will give you a good starting point. There are plenty of online food sites that list calorie counts, they are also on all food labels as well. Seek the support of a nutritionist or your doctor to begin to learn how to eat better and lose weight.